Hurricane Names - How are Hurricanes Named? Hurricane Fran: Satellite image of a hurricane named "Fran." Hurricane Fran was a large, powerful, destructive hurricane that made landfall near Cape Fear, North Carolina on September 5, 1996. Fran was the sixth named storm of the 1996 hurricane season. It was so destructive that the name "Fran" was retired from use. Satellite image by NASA. Hurricanes occur every year, and sometimes two or three hurricanes can be active at the same time. Using names for these storms makes it much easier for meteorologists, researchers, emergency response workers, ship captains and citizens to communicate about specific hurricanes and be clearly understood. For that reason, the World Meteorological Organization develops a list of names that are assigned in alphabetical order to tropical storms as they are discovered in each hurricane season. Names can be repeated after an interval of six years, but the names of especially severe storms are permanently retired from use. In the Atlantic Ocean, tropical storms that reach a sustained wind speed of 39 miles per hour are given a name, such as "Tropical Storm Fran." 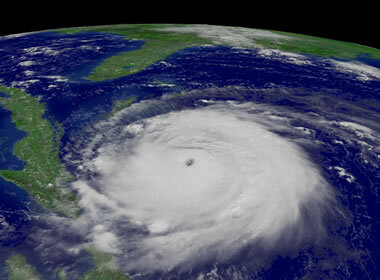 If the storm reaches a sustained wind speed of 74 miles per hour, it is called a hurricane - such as "Hurricane Fran." So, hurricanes are not given names, tropical storms are given names, and they retain their name if they develop into a hurricane. The names used for recent and future Atlantic storms are listed in the table on this page. Names have been given to Atlantic hurricanes for a few hundred years. People living in the Caribbean Islands named storms after the saint of the day from the Roman Catholic liturgical calendar for the day on which the hurricane occurred such as "Hurricane San Felipe." When two hurricanes struck on the same date in different years, the hurricanes would be referred to by names such as "Hurricane San Felipe the first" and "Hurricane San Felipe the second." In the early days of meteorology in the United States, storms were named with a latitude / longitude designation representing the location where the storm originated. These names were difficult to remember, difficult to communicate and subject to errors. During the Second World War, military meteorologists working in the Pacific began to use women's names for storms. That naming method made communication so easy that in 1953 it was adopted by the National Hurricane Center for use on storms originating in the Atlantic Ocean. Once this practice started, hurricane names quickly became part of common language, and public awareness of hurricanes increased dramatically. In 2017, Hurricanes Harvey, Irma, Maria, and Nate caused significant damages and fatalities. Out of respect for the people who suffered losses, these names were retired and will not be used again for tropical storms. A list of names that have been retired from 1979-2017 can be viewed on this page. In 1978, meteorologists watching storms in the eastern North Pacific began using men's names for half of the storms. Meteorologists for the Atlantic Ocean began using men's names in 1979. For each year a list of 21 names, each starting with a different letter of the alphabet, was developed and arranged in alphabetical order (names beginning with the letters Q, U, X, Y and Z were not used). The first tropical storm of the year was given the name beginning with the letter "A," the second with the letter "B" and so on through the alphabet. During even-numbered years, men's names were given to the odd-numbered storms and during odd-numbered years, women's names were given to odd-numbered storms (see the table for recent name lists). Today, the World Meteorological Organization maintains the lists of Atlantic hurricane names. They have six lists which are reused every six years. The only change that is made to the list of Atlantic hurricane names is the occasional retirement of a name. This is done when a hurricane causes so much death and destruction that reuse of the same name would be insensitive to the people who suffered losses. When that happens the World Meteorological Organization replaces the name. For example, "Katrina" has been retired from the name list and will not be used again. A list of hurricane names that have been retired since the current name list system was established in 1979 is shown on this webpage. In addition to retirements, there are a few names that were simply changed. For example, on the 2007 list the names Dean, Felix and Noel were replaced with Dorian, Fernand and Nestor for the 2013 list. 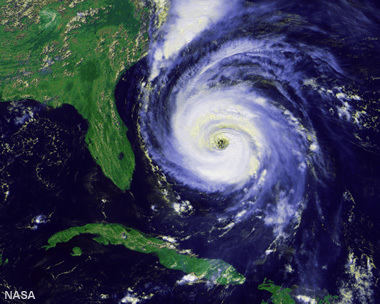 Hurricane Frances: Satellite image of a hurricane named "Frances" as it approaches Florida. Satellite image by NASA. There are normally fewer than 21 named tropical storms in any calendar year. In the rare years when more than 21 storms are named, the additional storms are given names from the Greek alphabet: Alpha, Beta, Gamma, Delta are used for their names. Tropical storms occur in the Pacific Ocean, and meteorologists working there have developed naming systems for them. Separate naming systems are maintained for Eastern North Pacific storms, Central North Pacific Storms, Western North Pacific Storms, the Australian Region, Fiji Region, Papua New Guinea Region, Philippine Region, Northern Indian Ocean, and Southwest Indian Ocean. The National Hurricane Center maintains lists of the names used in these areas.